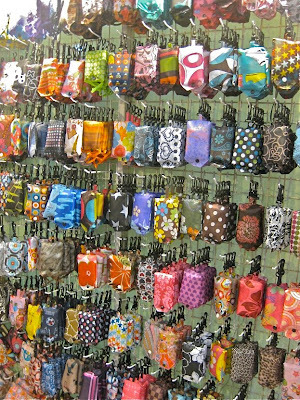 1. last month, while browsing the stalls at the american women's club bazaar at world trade center, we spotted this colorful display of folded-up bags: they were, of course, nylon eco-bags that you stash in your purse, so you can use it when you go shopping. say no to plastic (or paper, for that matter) shopping bags! these are nice because they come in a matching pouch, they don't take up much space, and they're super-light. 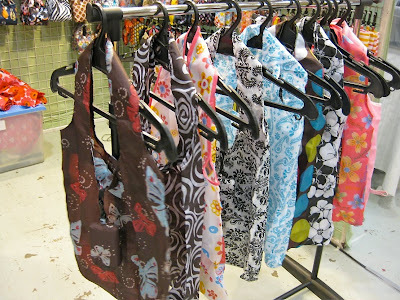 this is what they look like un-folded: we were attracted to the colorful prints (ano pa?) and ended up buying a marimekko unikko print—our favorite! (you can see a hint of it above, on top of the plastic box.) 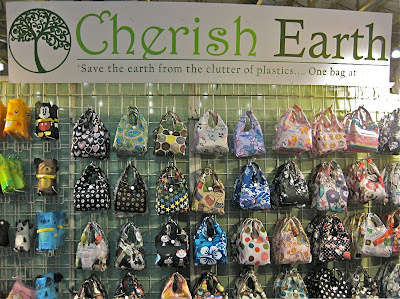 the brand is cherish earth, which has stores in glorietta and trinoma. they'll also be at the next american women's club bazaar, which happens every last tuesday of the month at the world trade center, from 8:30am-2:30pm. 2. our DM wanted to buy walnuts and she was able to buy some at cash & carry over the holidays, so we went. unfortunately, they were no longer available. since this was our first time here, we decided to explore this mall (supermarket! shops! tiangge! cinema! food court! plus what we used to call PX goods) until at some point we had to ask ourselves, where the hell are we?? nothing looked familiar. but look at what we found: a crocs outlet store! 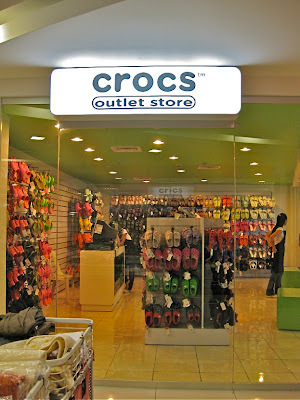 you can get your crocs fix here at 30% off. 3. the other day, on our way to the mich dulce exhibit, we walked by adora and spotted a cute printed spring coat on the mannequin in the window. we had to go in and ask if it was on sale. the adora sales staff are always so helpful, they offered to go get one from the stock room, discovered it was the last piece, took it off the mannequin, then informed us it was part of their buy one-take one sale! and it was 50% off! woo-hoo!! so we looked around for the second piece (and we even saw judy ann santos shopping the luxury-designer section—also on sale!). ended up with a LBD. sale is on till the end of the month. go before the racks are emptied! 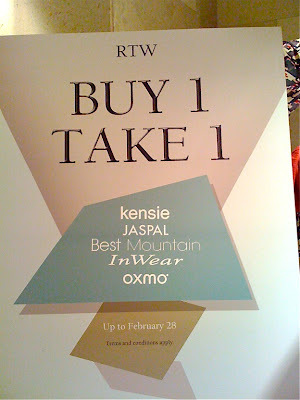 I wanna see the Unikko! you can see a hint of it in the second photo! di naman.. we asked to look at a few marimekko bags (kasi medyo tabingi ang stitching hehe), then set them aside to take pictures.we'll email you a pic!